Hearing politics from the pulpit is a common occurrence for a majority of churchgoers, according to a newly released Pew Research Center survey. Clergy most commonly preached about the issues of religious liberty and homosexuality, but far fewer spoke either for or against a 2016 presidential candidate. 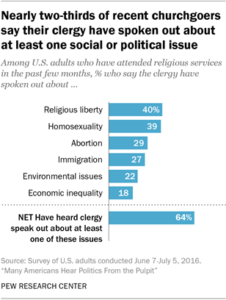 In the survey conducted June 5-7 and published August 8, 64 percent of churchgoers attending service in the last few months said their clergy spoke on at least one public policy-related issues. However, many clergy avoid discussing social or political issues on a regular basis. Nearly half of churchgoers said their clergy rarely or never talk politics on an average Sunday. Religious liberty and homosexuality were the most frequently mentioned policy issues heard from a preacher’s pulpit. Forty percent of churchgoers heard their clergy speak on religious liberty and 39 percent on homosexuality, while abortion, immigration, environmental issues, and economic inequality followed closely behind as hot button issues. Interestingly, more churchgoers heard their clergy approach religious liberty, homosexuality, and abortion from a traditionally orthodox worldview. By contrast, immigration, environmental responsibility, and economic inequality issues were largely presented by a traditionally liberal perspective. Broken down by demographics and denominations, white Evangelicals and Catholics were more likely to hear their clergy speak in defense of religious liberty. Only 28 percent of Mainline Protestants and 17 percent of Black Protestants heard their ministers say religious liberty is under attack. Discussion about homosexuality also differs among demographics and denominations. While 19 percent of Mainline Protestants heard their clergy encourage the acceptance of lesbians and gays, only 6 percent of white Evangelicals and 9 percent of Black Protestants heard this same message from the pulpit. Among other findings from the survey is that only 14 percent of churchgoers heard their clergy directly endorse or condemn a candidate. 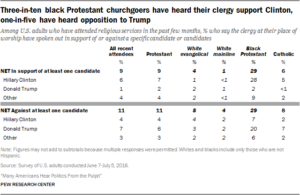 However, Black Protestant churchgoers (29 percent) were more likely to hear their clergy discuss specific candidates from the pulpit. Hillary Clinton was the most popular among Black Protestant clergy with 28 percent of Black Protestants saying their pastor spoke in support of Hillary Clinton from the pulpit. 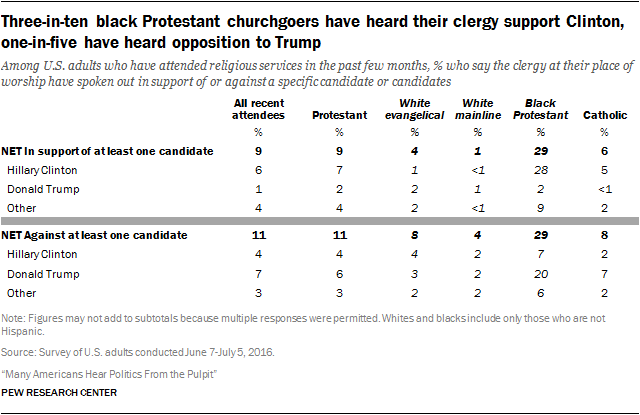 By contrast, 20 percent of Black Protestants heard their clergy speak against Donald Trump during a church service. Obviously, it is good few clergy are endorsing candidates from the pulpit. But we hope churches continue addressing social policies. Issues like abortion and homosexuality aren’t political topics, they are sin topics. Churchgoers can also benefit from hearing how Christians can have a well-informed, faithful witness among hostile religious liberty, immigration, environmental, and economic debates. Hopefully, clergy will continue addressing these important issues long after the election polls close.